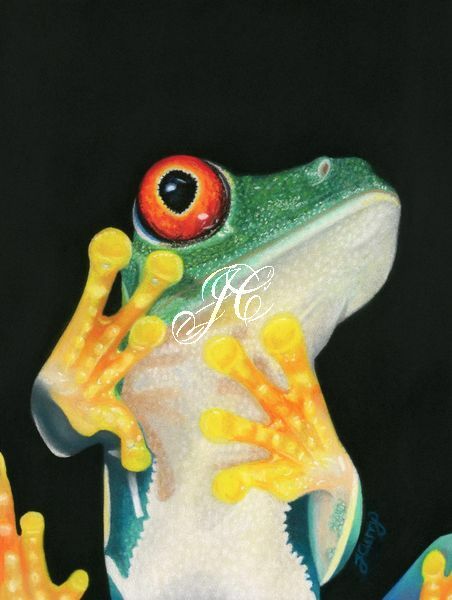 This gorgeous frog has so much character I was just drawn in to the reference as soon as I saw it. It is a Red-Eyed Tree Frog (Agalychnis callidryas) and is native to Neotropical rainforests where it ranges from Mexico through South America to Columbia. The frogs are not poisonous, they rely on camouflage to protect themselves. During the day it remains motionless, with its eyes closed and its feet tucked in blending in to the green of the rainforest, when startled it opens it eyes and the red colour of its eyes are meant to startle the predator giving it precious time to flee. Size is 12 x 16cm. Reference Photo from Storyblocks. Mixed Media on Clairefontaine Pastelmat. This is my entry for the Twitter Art Exhibition 2019 #TAE19 @twitterartexhibiton see http://twitterartexhibit.org to see more of these gorgeous artworks to raise money for "Art in Healthcare" @artinhealthcare based in Edinburgh Scotland. It's such a wonderful cause, each year the Twitter Art Exhibit is held in a different country and the money is donated to a charity dedicated to healthcare in that country. This piece will be either be sold during the event or online after the event if your interested in purchasing it, please go to the Twitter Art Exhibition website opening night is 11th May.